"Giving a gift of support"
Give to help us help you! Your giving empowers us to do more for the community. Let me encourage you to search your hearts and participate in our efforts to bring services to the community through your active involvement in our workshops, online store shopping, and contributions to our programs. Help others in the community receive resources to help them be empowered through Christ to live victoriously. God bless YOU in your giving. 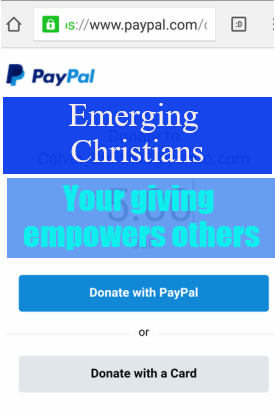 Emerging Christians is not a not for profit. Our programs include: Domestic Violence Training for Clergy, Personnel Development in the Workplace, Marriage Enrichment Retreats, and the Relationship Master Class. If you would like more information in how you can participate in one of these please feel free to contact us (405)748-0091. Ask about scholarships that you may qualify for. I want to thank you personally for visiting Emerging Christians. I hope that you will be spiritually enriched, blessed through this ministry. It is through your financial support that we are able to fund new projects for the growth and development in the community. Also, if you would like for me to come visit your group, speak at a workshop, training, or other personal development endeavor, do not hesitate to ask. May your days be filled with joy and peace. ​Please make your contributions through the following donate link below. We appreciate your prayers and your support. God bless you. ​Thank you for your gift.